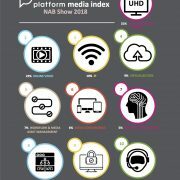 London, 30 April 2018 – Platform Communications, the media and entertainment technology communications expert, announces the Platform Media Index for NAB Show 2018, revealing that ‘High Resolution Video’ has overtaken ‘Online Video’ as the industry’s hottest topic in the press. The Index provides a snapshot of leading media technology trends, the news being made by key players and the discussions media are covering around major events. 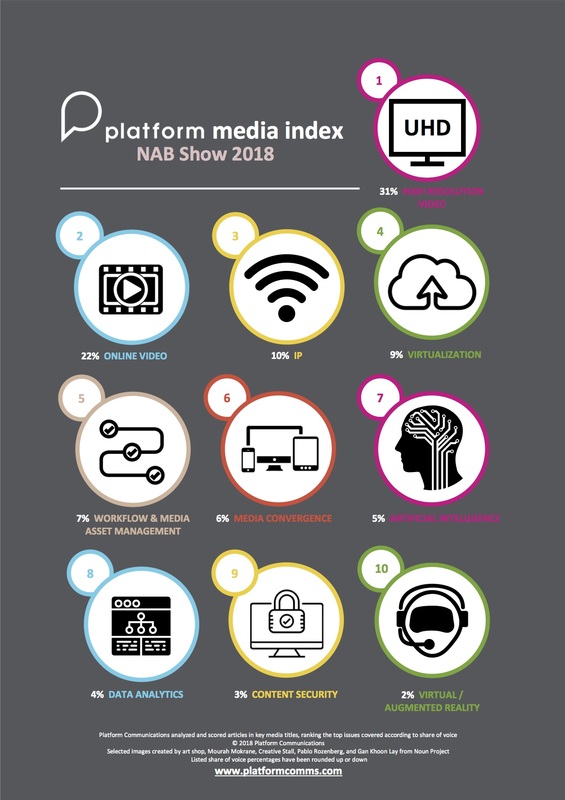 The top five topics at NAB Show were ‘High Resolution Video’ (31% share of voice), ‘Online Video’ (22%), ‘IP’ – Internet Protocol – (10%), ‘Virtualization’ (9%) and ‘Workflow and Media Asset Management’ (7%). These five categories accounted for 79% of all NAB coverage tracked before, during and after the conference and exhibition, which took place in Las Vegas, April 9-12. Gay Bell, Chief Executive of Platform Communications, says: “It’s an exciting time to be a part of the media and entertainment industry and observe how trends, and the conversations about them, are evolving. The Platform Media Index offers great insight into what topics as hot – and which ones are cooling. Capturing close to a third of share of voice in the Index – up from 20% last year – ‘High Resolution Video’ moved from second place in 2017 to the top spot this year, underlining the fact that 2018 is rapidly emerging as the year 4K starts to come of age. Around half of TV sets shipped in Western Europe are now 4K and the number is even higher for North America and China. The growing consumer appetite for more high-resolution content was reflected in this year’s NAB news cycle, which saw a flurry of 4K solution launches. The media also picked up on the debate around AV1, HEVC and the future of codecs in delivering high resolution content. 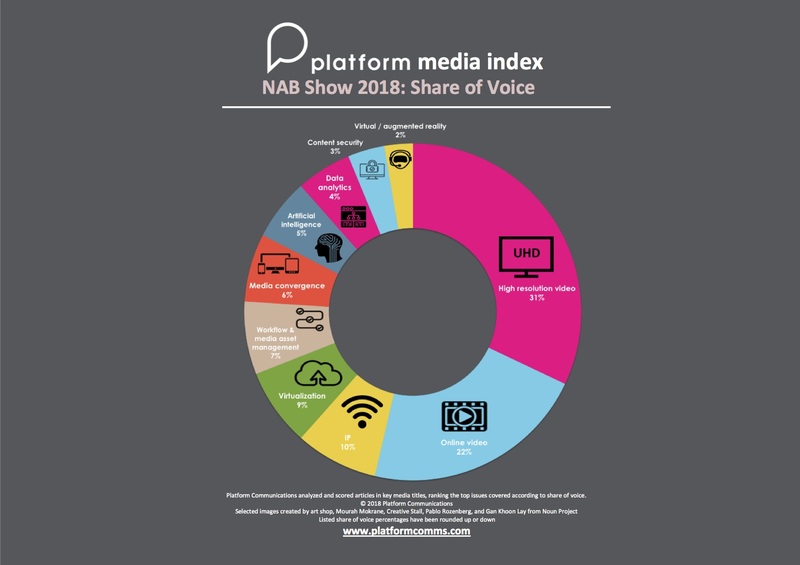 ‘Online Video’ dominated discussions at last year’s NAB and IBC shows, and despite ‘High Resolution Video’ leapfrogging it to first place, it has remained a huge topic of conversation, capturing more than a fifth of share of voice. Driving coverage around online video were stories discussing the continuing disruption of traditional business models by nimble over-the-top (OTT) players with on-demand services. Reports from NAB Show 2018 revealed that, to counteract the challenge to traditional TV, broadcasters such as Sinclair Television Group are looking to develop their own subscription video on demand (SVOD) offerings. The term ‘IP’ took third spot. Its high placing in NAB coverage illustrates that the industry is extremely conscious of how fast it is moving towards an all IP world, particularly as cable and satellite providers continue to migrate services to IP. Rob Pergoraro of FierceCable called the switch to IP “the biggest change in television broadcasting since the digital TV transition”. Much of the conversation on IP stemmed from NAB Show’s IP Showcase, which featured over 60 manufacturers and eight of the industry’s premier standards bodies and trade alliances. Rounding out the Media Index top five, ‘Virtualization’ swapped places with ‘Workflow and Media Asset Management’, moving up from fifth spot last year to fourth in 2018. Share of voice for ‘Virtualization’ held steady at 9%, but coverage of ‘Workflow and Media Asset Management’ fell from 10% to 7%. Along with IP, other topics that took their place in Platform’s NAB Index for the first time this year included ‘Artificial Intelligence’ and ‘Content Security’. ‘Data Analytics’ saw the biggest drop within the table, falling from third to eighth. 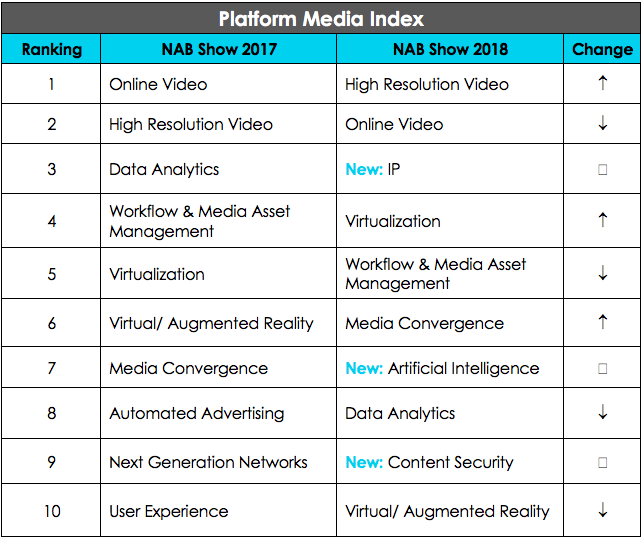 ‘Virtual/ Augmented Reality’ also fell in the table, moving from sixth to tenth spot – reflecting a noticeable decrease in the number of VR/AR demos on the NAB Show floor since the previous year. ‘Automated Advertising’, ‘Next Generation Networks’ and ‘User Experience’ dropped out of the top 10 altogether. For the full ranking download the infographic here, and for a breakdown of each topic’s ‘share of voice’, see below.